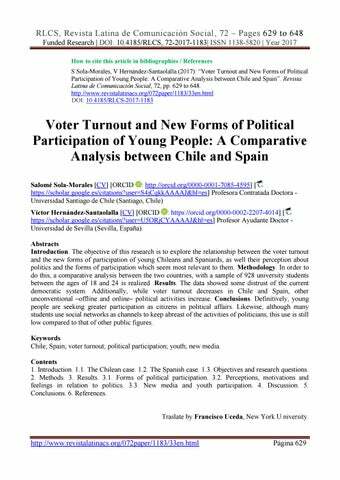 Voter Turnout and New Forms of Political Participation of Young People: A Comparative Analysis between Chile and Spain Salomé Sola-Morales [CV] [ORCID : http://orcid.org/0000-0001-7085-4595] [ https://scholar.google.es/citations?user=S4jCqkkAAAAJ&hl=es] Profesora Contratada Doctora Universidad Santiago de Chile (Santiago, Chile) Víctor Hernández-Santaolalla [CV] [ORCID : https://orcid.org/0000-0002-2207-4014] [ https://scholar.google.es/citations?user=U5ORjCYAAAAJ&hl=es] Profesor Ayudante Doctor Universidad de Sevilla (Sevilla, España). Abstracts Introduction. The objective of this research is to explore the relationship between the voter turnout and the new forms of participation of young Chileans and Spaniards, as well their perception about politics and the forms of participation which seem most relevant to them. Methodology. In order to do this, a comparative analysis between the two countries, with a sample of 928 university students between the ages of 18 and 24 is realized. Results. The data showed some distrust of the current democratic system. Additionally, while voter turnout decreases in Chile and Spain, other unconventional –offline and online– political activities increase. Conclusions. Definitively, young people are seeking greater participation as citizens in political affairs. Likewise, although many students use social networks as channels to keep abreast of the activities of politicians, this use is still low compared to that of other public figures. Keywords Chile; Spain; voter turnout; political participation; youth; new media. Contents 1. Introduction. 1.1. The Chilean case. 1.2. The Spanish case. 1.3. Objectives and research questions. 2. Methods. 3. Results. 3.1. Forms of political participation. 3.2. Perceptions, motivations and feelings in relation to politics. 3.3. New media and youth participation. 4. Discussion. 5. Conclusions. 6. References. Traslate by Francisco Uceda, New York U niversity. RLCS, Revista Latina de Comunicación Social, 72 – Pages 629 to 648 Funded Research | DOI: 10.4185/RLCS, 72-2017-1183| ISSN 1138-5820 | Year 2017 sharing responsibilities, becoming involved in public life, or getting concerned with issues of general interest. Specifically, some authors have indicated that while voter turnout decreases, other unconventional political activities expand, but more in line with the way that people experience community life and ways to participate in politics (Norris, 2002). Research into political participation is a multifaceted phenomenon (Teney and Hanquinet, 2012). Political engagement is currently divided into several repertoires: ―conventional participation‖ versus ―unconventional participation‖ (Contreras-Ibáñez et al., 2005; Delfino et al., 2007; Goldstone, 2003; Heaney and Rhodas, 2006; Maravall, 1981; McFarland and Thomas, 1996; Milbrath, 1965); individual ―institutionalized‖ versus ―noninstitutionalized‖ participation (Ganuza and Francés, 2008; Hooghe and Marien 2013); or online versus offline participation (Dahlgren, 2011; Gibson and Cantijoch, 2013; Kim et al., 2016; Resina de la Fuente, 2010; Visers, 2014; Zarzuri, 2005). However, there is no theoretical consensus about these categories that are currently changing. In fact, the Internet has begun to transform political life (Cotarelo and Crespo, 2012; Chadwick, 2013) and has started to have a major impact on democracy (Barber, 1998; Hacker and Van Dijk, 2000; Hagen, 2000; Pal, 1997; Subirats, 2002). Likewise, the increasingly important role of new media among young people has led to a debate on the potential of the internet as a means of political communication that encourages youth participation (Anduiza Perea et al. 2000; Banaji and Buckinjam, 2010; Colombo Villarrasa, 2007; Cotarelo and Crespo, 2012; García Galera and Hurtado, 2013; Gerodimos, 2010; Hill and Hughes, 1998; Karakaya, 2005; Rudenko, 2009; Sampedro, 2011; Shadrin, 2000; Sirkkunen and Kotilainen, 2004; Ugarte, 2007; Ward 2005). With respect to previous research, there are numerous studies that link youth, new media, and political participation (Coleman, 1999; Coleman and Rowe, 2005; Collin, 2008; Dahlberg, 2001; Gerodimos, 2010; Robles, 2006) that combine theoretical and empirical analysis. Even so, there are specific studies in Spain which have focused on the voting behavior of young people (Mateos and Moral, 2006) or the link between the Internet, youth, and politics (Author, 2015; Rubio-Gil, 2012; Subirats et al., 2015). Recent empirical research –especially in Europe– is questioning the relation between trust in politics and new forms of participation pointing out variables such as socioeconomic state and level of education (Dejaeghere and Hooghe, 2006; Thijssen et al., 2016). However, there still exists a lack of empirical research to analyze the causes of abstention of young people in relation to the new ways in which the youth participates in politics in Spain and Chile. Similarly, there is a lack of comparative studies on the link between civic motivations of young people and their ways of participating in politics, a fact that demonstrates the need to continue working on these areas. Ultimately, in order to fully understand the relation between low voter turnout and new forms of participation, solid and convincing results will be generated to extrapolate the analysis of possible policy alternatives in the Chilean and the Spanish case. To that end, the following four criteria have been explored, which will give the keys to understanding the possible ―crisis‖ of participation in the two countries surveyed: 1) Forms of political participation (conventional versus unconventional and offline versus online), 2) Perceptions, motivations and feelings associated with politics, and 3) new media and youth participation. RLCS, Revista Latina de Comunicación Social, 72 – Pages 629 to 648 Funded Research | DOI: 10.4185/RLCS, 72-2017-1183| ISSN 1138-5820 | Year 2017 Center for Sociological Research in October, which indicated that 83.6% of respondents surveyed were likely to vote (CIS, 2011a). In any case, the highest rate of abstention comes when deciding the representatives for the European Parliament. In this regard, in the last elections held on May 25, 2014, 56.2% of those eligible to vote did not go to the polls. However, beyond the low turnout, the fact is that this election marked a turning point in the Spanish democracy, as it glimpsed the breakdown of bipartisanship. Thus, the surprising progress of Podemos party as a political force appeared to be a response to the complaints shown by a large segment of the public, disappointed with the management of the other parties (Urquizu, 2015). At the same time, policy makers realized that new times, that required new faces, were coming. The day after the European Parliament elections, Alfredo Pérez Rubalcaba resigned as leader of the Spanish Socialist Workers Party, while Juan Carlos I abdicated the crown a week later (Díez, 2014). Returning to the problem of abstention, this has traditionally been associated with socioeconomic status. In this regard, while it is evident that the differences are not as extreme as in other countries (Gallego, 2013), the fact is that the middle and upper classes do seem to have a higher participation rate in Spain, as seen in the data from the post-election polls that were conducted by the Center for Sociological Research (CIS 2011b, 2014). Meanwhile, with regard to age, it should be noted that, similar to what happened in the Chilean case, this is still more significant in the case of young people under thirty years of age (Alconchel, 2011; Francés García and Santacreu Fernández, 2014; Mateos and Moral, 2006; Serrano and Sempere, 1999), similar to what is happening in most European countries (Anduiza Perea, 2001; Laiz Castro, 2011). Although one can not rule out that this disaffection is influenced by certain characteristics of this age (Martín Hernández, 2006), this appears to be a consequence of high distrust of young people towards the current democratic system (Francés García and Santacreu Fernández, 2014), not towards democracy as political regime, regardless of whether the majority still see the vote as a civic and moral duty. This idea is reinforced by the fact that although this sector of the population goes the least to the polls, yet it is the most involved in unconventional forms of participation such as demonstrations or protests. In other words, as a rejection to the traditional political offer, young Spaniards move away from the institutionalized mechanisms of political participation, but still actively participate in national political life. Therefore, it cannot be argued that young Spaniards are not interested in politics, but rather that they conceive it differently. Thus, compared to casting a vote or being affiliated to a traditional party, they prefer to carry out other actions, which they consider more effective, as well as connecting to certain political organizations that propose a ‗break‘, for example, from the current party system (Francés García and Santacreu Fernández, 2014). 1.3. Objectives and research questions The overall objective of this research is to understand the relationship between voter turnout and new forms of participation of young Chileans and Spaniards. In order to do this, we analyze what the perceptions about politics and the most relevant forms for youth participation are, and evaluate how the new media are transforming the form of participation. Specifically, this paper aims to answer the following research questions: RQ1. What are the forms of political participation most frequently used by Chilean and Spanish students? RQ2. What is the opinion of the Chilean and Spanish students about the electoral system and the activity of political parties? Our country would be better governed if our politicians listen to what the people want. I would like the citizens to have more opportunities to participate in political decisions. I prefer a country where citizens organize to exercise their rights. I would be interested in sending my opinions regularly to the government if it is easier than it is now. Elections are the most efficient opportunity for a citizen to influence the political. It is the fault of politicians if young people do not participate in political and democratic affairs. I think that young people are not interested in political participation. Political issues are too complex to have an opinion. RLCS, Revista Latina de Comunicación Social, 72 – Pages 629 to 648 Funded Research | DOI: 10.4185/RLCS, 72-2017-1183| ISSN 1138-5820 | Year 2017 To defend my interests I would prefer to choose someone younger 0.055 even if belonging to a political party that I do not like. Politicians worry about the opinions of people like me. RLCS, Revista Latina de Comunicación Social, 72 – Pages 629 to 648 Funded Research | DOI: 10.4185/RLCS, 72-2017-1183| ISSN 1138-5820 | Year 2017 of participation. In fact, regardless of whether forms are preferred –conventional in the Chilean case or unconventional in the Spanish case–, the channel does not influence. One of the current premises regarding the political participation of the youth is that this segment does not carry out certain conventional activities, such as exercising the right to vote at the polls or joining a political party, because they do not consider them to be truly effective, reinforcing the idea that young people distrust the current democratic system (Francés García and Santacreu Fernández, 2014; Morales Quiroga, 2008; Paramio 1999a, 1999b; Thezá Manríquez, 2003; Toro 2007). The results generally confirm the idea. As for the second highlighted initiative, militancy, young respondents tend not to join political parties because, once again, see little value in it. However, this should not be understood as a sign of disinterest in this segment in particular, for reducing the rate of militancy is a tendency in many democratic countries (Van Biezen et al., 2012; Whiteley, 2011); although precisely in the countries analyzed, the inclination is not so drastic. However, only a small percentage acknowledges real value in elections to influence political decisions, which would explain the high abstention rate, and the lack of a special feeling associated with casting or not casting the vote. In any case, it is interesting to see how there is a higher percentage of young people who decide to vote because they consider it important to express their opinion, simply because they understand that it is their duty, even though in Chile voting was compulsory until 2013. In other words, the study finds that more young people vote because they want to be heard, simply because they consider that it is their duty, which coincides with the call for greater participation of citizens in the above mentioned policy. Finally, in order to finish the issue of voter turnout, it is interesting to analyze the relationship between participation and ideological selfdefinition. In this respect, while in Spain left wing or center-left voters are the most active in the polls, in Chile voting corresponds to those who recognized themselves as right-wing voters. On the other hand, those who did not identify with any ideological position were the least involved in the electoral process. Therefore, the research confirms the idea that young people, although possibly in line with other segments of the population, are abandoning certain conventional policy actions, such as party affiliation or the electoral vote (Morales, 2005; Norris, 2002). However, this should not be understood directly as a general lack of interest in politics. On the contrary, young people feel that citizens should have a greater role in political life in general. Indeed, Chilean and Spanish students share an opinion about electoral system and about political parties‘ activity. Moreover, both youngsters take up a stance to boost citizenship and increase participation. In the same vein, there is a common critical perspective about the role of politicians and the Government. Regarding the use of Internet and social media, although many young Chileans and Spaniards track the activities of politicians on Facebook or Twitter, their interest is lower –with some minor differences between countries—to the one shown towards athletes, singers, actors, and other film and television celebrities. In short, the results denote that the sector of the youth surveyed is disenchanted with the current political system, which translates into the search for new actions beyond those offered by institutions. The problem is that, although they seem to show an interest in these alternative activities and consider them to be beneficial to the citizens to obtain greater power in democratic decisions, there are few who take the plunge and participate in such actions. RLCS, Revista Latina de Comunicación Social, 72 – Pages 629 to 648 Funded Research | DOI: 10.4185/RLCS, 72-2017-1183| ISSN 1138-5820 | Year 2017 5. Conclusions In light of the results, we can say that, rather than a lack of interest in politics in general, university students from Chile and Spain are disappointed with the democratic system of their respective countries. This is the result of two issues: first, shared negative opinions about political systems and politicians and second, positive opinions about strengthening the level of participation of all citizens in political life. In this sense, although most Chilean students stated that they did not vote because of their dissatisfaction with the system and the political parties because they considered that such action would change nothing; in Spain, a high percentage said they did not participate in elections for reasons beyond their control, or because they simply did not have a clear idea about for whom to cast their vote. In short, this would confirm that there is not a causal or direct relationship between low voter turnout and participation. In fact, within the framework of this research, many more respondents said that they were involved in different and alternative forms of participation from vote (conventional or unconventional, online or offline forms of participation). As for the feelings associated with exercising or not exercising their right to vote, although a large percentage admitted not feeling anything regardless of the action taken, it can be attributed to major differences between countries, especially between those who did not vote. Thus, compared to the pride and self-acknowledged interest of Chileans, a significant group of Spaniards said they were afflicted, which can be related to the manifest impossibility of exercising the right to vote. In short, although no assurances can be given as to the reasons that lead or not to casting a vote, one can still notice certain common trends. Those who vote do it generally as a matter of duty or obligation, to which they either do not feel anything, or feel proud and interested in politics. Opposite to these voters are those who do not vote because they do not agree with the system, or because they cannot agree with it philosophically, to which they either do not feel anything also, or feel proud and interested in politics, as is the case of those mentioned earlier, or afflicted as is the case of the latter. It is clear that democratic participation is being transformed by the use of social networks and new media, which is reflected in the data about channels of information on policy today by university students from both countries. In this regard, although not the favorite subject of this population segment, virtual platforms have allowed young people to consume and to share information policy beyond their family, or even beyond their core group of friends and college classmates. In this respect, because students ask for greater involvement and political engagement, Internet may play a key role. Although many new forms of participation should not have significant impact on ―real‖ politics, they are transforming the way citizens understand politics, feel active or participative. In any case, in light of the results obtained, and in a changing context in which the Internet is much more than simply a communication tool among young people, the concept of political participation needs to be re-examined. It would also be necessary to further examine the reasons for youth abstention, and to supplement the study with other forms of research, either quantitative or qualitative, as this seems to be a matter of concern. This is especially true in post-dictatorial societies where democracy is still a young system. Similarly, there is a lack of consensus and a variety of concepts used in the literature to define similar processes. We are referring to the so-called indifference, disaffection, apathy, and distrust of young people towards politics, which makes the field blurrier than it should. Funding and acknowledgements This article is part of the project ―Chilean youth participation in democratic life. Impact of new media,‖ code 031496SM, funded by the Department of Scientific and Technological Research (DICYT), from the office of Research, Development, and Innovation of the University of Santiago, Chile, for which Ph.D. Salomé Sola-Morales is the main researcher. This project was carried out between March 2014 and March 2016. Thanks to Santander Bank, which funded a postdoctoral fellowship for the author, Sola-Morales was able to stay at the Complutense University of Madrid, Spain, where she was able to gather information for the Spanish section of the study in 2014. The survey designed for this study extrapolates and adapts the EACEA 2010/13 survey used in the project for the European Commission, from the London School of Economics, where Ph.D. Salomé Sola-Morales was co-investigator of the Spanish team during 2012. Thanks for their cooperation in research should also be extended to Mercè Diez, Mayte Donstrup, Regla María López and Andrea Maestre. Dates: Start: March 2014. End: March 2016. 6. References M Alcántara (1994): Gobernabilidad, crisis y cambio. Madrid: Centro de Estudios Constitucionales. G Alconchel (2011): ―Jóvenes, ciudadanía y participación política. Seguridad y Ciudadanía‖. Revista del Ministerio del Interior 6: 191-217. D Altman (2004): ―Redibujando el mapa electoral chileno: incidencia de factores socioeconómicos y género en las urnas‖. Revista de Ciencia Política 24(2): 49-66. E Anduiza Perea, M Cantijoch, A Gallego & J Salcedo (2000): Internet y participación política en España. Madrid: Centro de Investigaciones Científicas. E Anduiza Perea (1999): ¿Individuos o sistemas? Las razones de la abstención en Europa occidental. Madrid: Centro de Investigaciones Sociológicas. E Anduiza Perea (2001): Actitudes, Valores y Comportamiento Político de los Jóvenes Españoles y Europeos. Un estudio comparado. Madrid: Instituto de la Juventud. S Banaji & Buckingham D (2010): ―Young people, the Internet, and civic participation: an overview of key findings from the CivicWeb Project‖. International Journal of Learning and Media 2(1): 15– 24. RLCS, Revista Latina de Comunicación Social, 72 – Pages 629 to 648 Funded Research | DOI: 10.4185/RLCS, 72-2017-1183| ISSN 1138-5820 | Year 2017 B Barber (1984): Strong Democracy: Participatory Politics for a New Age. Berkeley: University of California Press. B Barreiro (2002): ―La progresiva desmovilización de la izquierda en España: un análisis de la abstención en las elecciones generales de 1986 a 2000‖. Revista Española de Ciencia Política 6: 183–205. C Boix & C Riba (2000): ―Las bases sociales y políticas de la abstención en las elecciones generales españolas: recursos individuales, movilización estratégica e instituciones electorales‖. Revista Española de Investigaciones Sociológicas 90: 95–128. C Bromley, J Curtice & B Seyd (2004): Is Britain Facing a Crisis of Democracy? London: UCL Constitution Unit. P Bustos Pizarro (1997): ―Jóvenes: reflexiones en torno al tema de la participación y la política‖. Última Década 7: 97–122. R Carlin (2006): ―The decline of citizen participation in electoral politics in post-authoritarian Chile‖. Democratization 13(4): 632–651. A Chadwick (2013): The Hybrid Media System: Politics and Power. Nueva York: Oxford CIS (2011a): ―Estudio 2915. Preelectoral Elecciones Generales 2011. Panel (1ª Fase)‖: www.cis.es/cis/opencm/ES/1_encuestas/estudios/ver.jsp?estudio=11884 (25-04-2017). CIS (2011b): ―Estudio 2920. Postelectoral Elecciones Generales 2011 (2ª Fase)‖: www.cis.es/cis/opencm/ES/1_encuestas/estudios/ver.jsp?estudio=12604 (25-04-2017). CIS (2014): ―Estudio 3028. Postelectoral elecciones al Parlamento Europeo 2014‖: www.cis.es/cis/opencm/ES/1_encuestas/estudios/ver.jsp?estudio=14083 (25-04-2017). S Coleman (1999): ―The New Media and Democratic Politics‖. New Media & Society 1(1): 67–74. S Coleman & C Rowe (2005): Remixing Citizenship: Democracy and Young People’s Use of the Internet. London: Carnegie Young People Initiative. P Collin (2008): ―The Internet, Youth Participation Policies, and the Development of Young People‘s Political Identities in Australia‖. Journal of Youth Studies 11(5): 527–542. P Collin (2015): Young citizens and political participation in a digital society: addressing the democratic disconnect. Basingstoke: Palgrave Macmillan. C Colombo Villarrasa (2007): E-participación. Las TIC al servicio de la innovación democrática. Barcelona: Universitat Oberta de Catalunya. CC Contreras-Ibáñez, FE Correa Romero & LF García y Barragán (2005): ―Participación política no convencional: culturas de protesta vs. culturas institucionales‖. Polis 1(1): 181–210. R Cotarelo & I Crespo (comp.) (2012): La comunicación política y las nuevas tecnologías. Madrid: Catarata. M Crozier, SP Huntington & J Watanuki (1975): The Crisis of Democracy. Report on the Governability of Democracies to the Trilateral Commission. New York, NY: New York University Press. RLCS, Revista Latina de Comunicación Social, 72 – Pages 629 to 648 Funded Research | DOI: 10.4185/RLCS, 72-2017-1183| ISSN 1138-5820 | Year 2017 L Dahlberg (2001): ―Extending the Public Sphere through Cyberspace: The Case of Minnesota EDemocracy‖, First Monday 6(3): http://firstmonday.org/ojs/index.php/fm/article/view/838/747 (2504-2017). P Dahlgren (2011): ―Jóvenes y participación política. Los medios en la red y la cultura cívica‖. Telos 89: 12–22. Y Dejaeghere & M Hooghe (2006): ―Op zoek naar de ―monitorial citizen‖. Een empirish onderzoek naar de prevalentie van postmodern burgerscaho in Belgïe. [In search of the monitorial citizen: An empirical study on the prevalence of post-modern citizenship in Belgium]‖. Res Publica 48: 393– 420. GI Delfino, OD Fernández & EM Zubieta (2007): ―Participación política no convencional, valores culturales e ideología política. Un estudio con estudiantes universitarios‖. Investigaciones en Psicología 12(2): 69–88. M Delli (2000): ―Gen.com: Youth, civic engagement: Mobilizing voters as a required field experiment‖. Journal of Political Science Education 2: 205–227. A Díez (2014): ―Anabel Díez: Rubalcaba no era un político de este tiempo‖. El País, 26 June: elpais.com/elpais/2014/06/26/videos/1403800237_264874.html (25-04-2017). A Downs (1957): An Economic Theory of Democracy. New York: Harper and Row. FJ Francés García & OA Santacreu Fernández (2014): ―Crisis política y juventud en España: el declive del bipartidismo electoral‖. Società Mutamento Politica 5(10): 107–128. C Fuentes & AVillar (eds.) (2005): Voto ciudadano: Debate sobre la inscripción electoral. Santiago: Flacso. E Ganuza Fernández & FJ Francés García (2008): ―¿A qué llamamos participar en democracia? Diferencias y similitudes en las formas de participación‖. Revista Internacional de Sociología 49: 89–113. JJ García Escribano & MD Frutos Balibrea (1999): ―Mujeres, hombres y participación política: buscando diferencias‖. Reis 86: 307–332. MC García Galera & MH Hurtado (2013): ―Redes sociales, un medio para la movilización juvenil‖. Zer: Revista de Estudios de Comunicación 17(34): 111–125. MA Garretón (1990): ―La redemocratización política en chile. Transición, inauguración y evolución‖. Estudios Públicos 42: 101–133. MA Garretón (2002): ―La transformación de la acción colectiva en América Latina‖. Revista de la CEPAL 76: 7–23. R Gerodimos (2010): New Media, New Citizens: The Terms and Conditions of Online Youth Civic Engagement. PhD Thesis, Bournemouth University, UK. R Gerodimos & J Ward (2007): ―Rethinking Online Youth Civic Engagement: Reflections on Web Content Analysis‖. In BD Loader (ed.) Young Citizens in the Digital Age: Political Engagement, Young People and New Media. London: Routledge, pp. 114–126. RLCS, Revista Latina de Comunicación Social, 72 – Pages 629 to 648 Funded Research | DOI: 10.4185/RLCS, 72-2017-1183| ISSN 1138-5820 | Year 2017 R Gibson & M Cantijoch (2013): ―Conceptualizing and Measuring Participation in the Age of the Internet: Is Online Political Engagement Really Different to Offline?‖ The Journal of Politics 75(03): 701–716. JA Goldstone (2003): ―Introduction: Bridging Institutionalized and Noninstitutionalized Politics‖. In JA Goldstone (ed) States, Parties, and Social Movements. Stanford, CA: Stanford University Press, pp. 1–24. A Guillen, K Sáenz, MH Badii & J Castillo (2009): ―Origen, espacio y niveles de participación ciudadana‖. Daena: International Journal of Good Conscience 4(1): 179–193. KL Hacker & J Van Dijk (eds.) (2000): Digital democracy: Issues of theory and practice. London: SAGE. M Hagen (2000): ―Digital Democracy and Political Systems‖. In KL Hacker & J Van Dijk (eds.) Digital Democracy: Issues of theory and practice. London: Sage, pp. 54–70. M Heaney & F Rohas (2007): ―Partisans, Nonpartisans, and the Antiwar Movement in the United States‖. American Politics Research 35(4): 431–464. O Heath (2007): ―Explaining turnout decline in Britain, 1964-2005: Party identification and the political context‖. Political Behavior 29(4): 493–516. KA Hill & JE Hughes (1998): Cyberpolitics: Citizen Activism in the Age of the Internet. Lanham, MD: Rowman and Littlefield. M Hooghe & S Marien (2013): ―A Comparative Analysis of the Relation Between Political Trust and Forms of Political Participation in Europe‖. European Societies 15(1): 131–152. C Huneeus (2005): ―Sí al voto obligatorio‖. In C Fuentes C and A Villar (eds.) Voto ciudadano. Debate sobre la inscripción electoral. Santiago: Flacso, pp. 103–108. M Justel (1995): La abstención electoral en España, 1977-1993. Madrid: Centro de Investigaciones Sociológicas. R Karakaya (2005): ―The Internet and the Political Participation‖. European Journal of Communication 20(4): 435–559. Y Kim, S Russo & E Amnå (2016): ―The longitudinal relation between online and offline political participation among youth at two different developmental stages‖. New Media & Society 4, doi: 10.1177/1461444815624181. R Kimberlee (2002): ―Why don‘t British young people vote at general elections?‖ Journal of Youth Studies 5(1): 85–98. C Laiz Castro (2011): ―Principales tendencias de la abstención electoral en Europa‖. Seguridad y Ciudadanía. Revista del Ministerio del Interior 6: 41–88. S Madrid (2005): ―¿Políticos de ayer, apáticos de hoy? Generaciones, juventud y política en Chile‖. In C Fuentes and A Villar (eds.). Voto ciudadano: debate sobre la inscripción electoral. Santiago: Flacso, pp. 45–84. JM Maravall (1981): La política de la transición, 1975-1980. Madrid: Taurus. RLCS, Revista Latina de Comunicación Social, 72 – Pages 629 to 648 Funded Research | DOI: 10.4185/RLCS, 72-2017-1183| ISSN 1138-5820 | Year 2017 RA Mardones (2014): ―La democracia chilena: una aproximación a la desafección política‖. Papel político 19(1): 39–59. TH Marshall & T Bottomore (1998): Ciudadanía y clase social. Madrid: Alianza Editorial. A Martín Hernández (2006): Participación socio-política de los jóvenes españoles: medios y trayectorias. Unidad de Políticas Comparadas (CSIC): digital.csic.es/bitstream/10261/1672/1/dt0613.pdf (25-04-2017). A Mateos & F Moral (2006): Comportamiento electoral de los jóvenes españoles. Madrid: Instituto de la Juventud. A Mayol (2012): El derrumbe del modelo. Santiago: LOM ediciones. A Mayol & C Azócar (2011): ―Politización del malestar, movilización social y transformación ideológica: el caso Chile 2011‖. Polis 30: 1–19. C McCormack (1998): Building an educational system. New York: Wiley Computer Publishing. D McFarland & R Thomas (2006): ―Bowling Young: How Youth Voluntary Associations Influence Adult Political Participation‖. American Sociological Review 71: 401–425. E Megías (2006): Jóvenes y política. El compromiso con lo colectivo. Madrid: Injuve, FAD, Caja Madrid. M Merino (1996): La participación Ciudadana en la Democracia. Quito: CEPAL. LW Milbrath (1965): Political Participation: How and Why do People Get Involved in Politics? Chicago: Rand McNally. WE Miller (1980): ―Disinterest, disaffection, and participation in presidential politics‖. Political Behavior 2(1): 7–32. J Montero, R Gunther & M Torcal (1999): ―Legitimidad, descontento y desafección‖. Revista del centro de estudios públicos 74: 107–149. M Morales Quiroga (2008): ―Evaluando la confianza institucional en Chile: Una mirada desde los resultados LAPOP‖. Revista de Ciencia Política 28(3): 161–186. L Morales (2005): ―¿Existe una crisis participativa? La evolución de la participación política y el asociacionismo en España‖. Revista Española de Ciencia Política 13: 51–87. T Moulian (1997): Chile actual: Anatomía de un mito. Santiago: LOM ediciones. P Navia (2004): ―Participación Electoral en Chile, 1988-2001‖. Revista de Ciencia Política 24(1): 81–103. P Norris (1991): ―Gender Differences in Political Participation in Britain: Traditional, Radical and Revisionist Models‖. Government and Opposition 26(1): 56–74. P Norris (2002): Democratic Phoenix. Reinventing Political Activism. Cambridge: Cambridge University Press. RLCS, Revista Latina de Comunicación Social, 72 – Pages 629 to 648 Funded Research | DOI: 10.4185/RLCS, 72-2017-1183| ISSN 1138-5820 | Year 2017 T O‘Toole, M Lister, D Marsh, S Jones & A McDonagh (2003): ―Tuning out or left out? Participation and non-participation among young people‖. Contemporary Politics 9(1): 45–61. JS Pacheco (2008): ―Political Socialization in Context: The Effect of Political Competition on Youth Voter Turnout‖. Political Behavior 30(4): 415–436. LA Pal (1997): ―Virtual Policy Networks: The Internet as a Model of Contemporary Governance?‖ Internet Society: https://www.isoc.org/inet97/proceedings/G7/G7_1.HTM (25-04-2017). L Paramio (1999a): ―Estrategias partidarias y desconfianza política‖. Revista internacional de Sociología 22: 183–201. L Paramio (1999b): ―Cambios sociales y desconfianza política: el problema de la agregación de preferencias‖. Revista Española de Ciencia Política 1(1): 81–95. C Parker (2000): Los jóvenes chilenos: cambios culturales, perspectivas del siglo XXI. Santiago: Mideplan. C Parker (2003): ―Abstencionismo, juventud y política en Chile actual‖. Revista de estudios avanzados interactivos 4: 1–23. JM Payne, DG Zovatto, & M Mateo Díaz (2002): Democracies in development: Politics and reform in Latin America. Nueva York: IDB. S Pharr & R Putnam (eds.) (2000): Disaffected Democracies? What’s troubling the trilateral countries? Princeton, NJ: Princeton University Press. SJ Pharr, RD Putnam & RJ Dalton (2000): ―A Quarter-Century of Declinig Confidence‖. Journal of Democracy 11(2): 5–25. E Phelps (2006): ―Young citizens and Declining Electoral Turnout: Trends and Explanations‖. Annual conference ―The Elections, Public Opinion and Parties‖ (EPOP). Nottingham University. PNUD (2014): Auditoría para la democracia. Más y mejor democracia para un Chile inclusivo. : http://www.cl.undp.org/content/chile/es/home/library/democratic_governance/auditoria-a-lademocracia.html (25-04-2017). J Resina de la Fuente (2010): ―Ciberpolítica, redes sociales y nuevas movilizaciones en España: el impacto digital en los procesos de deliberación y participación ciudadana‖. Mediaciones Sociales 7 (2): 143–164. JM Robles (2006): ―Los jóvenes y las nuevas formas de participación política a través de Internet‖. Revista de Estudios de Juventud 75: 155–169. JM Robles (2008): Ciudadanía digital. Una introducción a un nuevo concepto de ciudadano. Barcelona: Universitat Oberta de Catalunya. A Rubio-Gil (2012): ―Participación política de la juventud, redes sociales y democracia digital. El caso Spanish Revolution‖. Telos 93: 106–115. VN Rudenko (2009): ―La ciberrepública y el futuro de la democracia directa‖. Contribuciones desde Coatepec 16: 165–176. RLCS, Revista Latina de Comunicación Social, 72 – Pages 629 to 648 Funded Research | DOI: 10.4185/RLCS, 72-2017-1183| ISSN 1138-5820 | Year 2017 J Sáez (1998): ―La decisión del elector: partidismo, racionalidad-economía y estructura social‖. Reis 98(2): 139–169. V Sampedro (ed.) (2011): Cibercampaña. Cauces y diques para la participación. Las elecciones generales de 2008 y su proyección tecnopolítica. Madrid: Universidad Complutense de Madrid. F Sánchez (1993): Ciudadanía sin fronteras: cómo pensar y aplicar una educación en valores. Bilbao: Desclée De Brouwer. J Serrano & D Sempere (1999): La participación juvenil en España. Barcelona: Fundació Francesc Ferrer i Guàrdia. JG Shields (2006): ―Political Representation in France: A Crisis of Democracy?‖ Parliamentary Affairs 59 (1): 118–137. E Sirkkunen & S Kotilainen (eds.) (2004): Towards Active Citizenship on the Net. Possibilities of Citizen Oriented Communication: Case Studies from Finland. Tampere: University of Tampere. T Skelton & G Valentine (2003): ―Political participation, political action and political identities: young D/deaf people‘s perspectives‖. Space and Polity 7(2): 117–134. J Subirats (2002): ―Los dilemas de una relación inevitable. Innovación democrática y tecnologías de la información y de la comunicación‖. In Cairo Carou H (ed.). Democracia digital. Límites y oportunidades. Madrid: Trotta, pp. 89–113. J Subirats, M Fuster, R Martínez, M Berlinguer & JL Salcedo (2015): Jóvenes, Internet y Política. Madrid: Centro Reina Sofía sobre Adolescencia y Juventud, Fundación de Ayuda contra la drogadicción. C Teney & L Hanquinet (2012): ―High political participation, high social capital? A relational analysis of youth social capital and political participation‖. Social Science Research 41: 1213–1226. M Thezá Manríquez (2003): ―Apuntes para una Resignificación de la Participación Política de los Jóvenes a partir del Eje Igualdad-Desigualdad‖. Última década 11(19): 47–70. P Thijssen, J Siongers, J Van Laer, J Haers & S Mels (2016): Political Engagement of the Young in Europe. Youth in the crucible. London: Routledge. M Torcal (2001): ―La desafección en las nuevas democracias del sur de Europa y Latinoamérica‖. Instituciones y desarrollo 8-9: 229–280. S Toro (2007): ―La inscripción electoral de los jóvenes en Chile: Factores de incidencia y aproximaciones al debate‖. In Fontaine A, Larroulet C, Viera-Gallo, JA and Walker I (eds.). Modernización del régimen electoral chileno. Santiago: PNUD, pp. 101–122. D Ugarte (2007): El poder de las redes. Barcelona: Ediciones El Cobre. I Urquizu (2015): ―15-M y Podemos: ¿almas gemelas?‖ El País, 31 January. : politica.elpais.com/politica/2015/01/31/actualidad/1422718489_860472.html (accesed 1 February 2015). I Van Biezen, P Mair & T Poguntke (2012): ―Going, Going,...Gone? The Decline in PartyMembership in Contemporary Europe‖. European Journal of Political Research 51: 24–56. Article received on 27 on April 2017. Accepted on 12 June. Published on 15 June 2017.